What determines the design of a bird's nest? You know the type of nest I'm talking about, right? A bald eagle's large platform nest, built with sticks, high up in the branches of a tree. Or maybe a scrape created in dirt or gravel on a shallow cliff ledge by nesting peregrine falcons. How about the burrows created by bank swallows and belted kingfishers, or the cavity nests excavated in trees by woodpeckers? Or am I thinking of the pendulant and sometimes very elaborate suspended nests created by orioles and weavers? When I think of bird nests, I think of the classic small cupped nests I collected as a child. But birds nest in a variety of ways and places, creating nests from twigs, sticks, moss, grass, fur or hair, roots, bark, leaves, pine needles, feathers, lichens, paper, insect cocoons, snakeskin, saliva, and other materials. They nest high in trees, but they also nest on the ground, under the ground, in the darkness of chimneys and caves, and even in active wasp nests. Some birds construct elaborate nests while others get by with a shallow scrape in a stolen or abandoned nest. Nests traditionally have been thought of as nothing more than places for birds to lay eggs and raise young. It was assumed that natural selection and the need to minimize the risk of predation determined the design of completed nests. However, recent research has found that sexual selection, parasites, and the need to build a nest that can handle variation in weather conditions (which we certainly see in Iowa, Colorado, and Minnesota!) also play significant roles in influencing nest design. How does sexual selection play a role in nest design? It goes something like this: birds that build awesome nests relative to other members of their species must be healthy, high-quality mates. Think about Decorah. 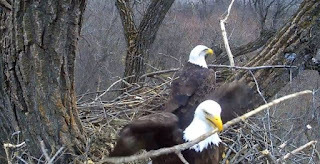 Mom and Dad spend a lot of time procuring and hauling wood and soft materials into the nest. This is a costly activity energetically speaking, and it requires both eagles to be in good shape - well-fed (which implies provisioning ability), skilled at flying, and relatively parasite-free. While different things might indicate quality to different species of birds, it appears that large nests signify quality among bald eagles. Bald eagle nests are bi-parentally built - that is, both parents work on them. However, in Decorah it is Dad who spends the most time getting the sticks just right, scraping in the nest bowl, and preparing the egg cup. Studies have found that female magpies adjust their reproductive effort in relation to the male's nest-building activities. The more time he spends working on the nest, the more time and energy she puts toward reproductive processes, including copulation. What could we watch for in our eagles? A study of male house sparrows found that they call to females when adding feathers to the nest, suggesting that they wish the behavior to be observed. The volume of feathers delivered by males was positively correlated with clutch size and female provisioning rates. While Dad doesn't usually vocalize when he places a stick, he often interacts with Mom in some way - taking a stick from her, moving sticks while she is in the nest, and so on. His obsession with proper placement might be his way of signaling fitness and getting more tailfeather from Mom to boot! I'm going to pay more attention to Mom and Dad's interactions during and following their sticky adventures! While the paper doesn't touch on intelligence, it is hard for me to believe that it isn't part of the total sexual selection package. Building a nest is a lot harder than it looks and requires a whole host of things: access to food (which implies hunting ability and understanding of a territory, among other things), strength (which implies access to food and a body relatively free of parasites), and flight skills (ditto). An intelligent bird will presumably make better decisions about maximizing energy gain, procuring food, and hauling and placing sticks. Its intelligence should help it live longer and build a sexier nest, which in theory will lead to more copulation, more fertilized eggs, and offspring that inherit Mom and Dad's traits. Bird parasites include lice, fleas, flies, mites, ticks, leeches, fungi, and bacteria. We've seen firsthand the damage that blackflies and hippoboscids can do: killing young falcons, driving young from the nest to early, and delaying development. Birds have a wide variety of responses to parasites, including molting feathers, the use of feather toxins, preening, and maintaining their nests. Watchers might remember Stitch and Spot, the red-tailed hawks from Eaglecrest Wildlife. Male Spot brought green plant material into the nest on a regular basis. The greenery (probably blue oak branches) contained high levels of monoterpenes and isoprene, which helped reduce parasites and fungi and may also have signaled fitness to female Stitch in the same way that a large nest might signal quality to a female eagle [a blog on greenery and parasites can be found here]. However, the bald eagles we watch don't appear to intentionally carry greenery into their nests. So what do they do? Many watchers have commented on the number of mice in the nest. For the mice, an eagle's nest offers food (scraps of protein and stomach and crop contents of prey), shelter, and safety from serious mouse predators like fox and owls. While bald eagles would eat a mouse, it isn't much more than an hors d'oeuvres compared to prey like pigeons, trout, squirrels, and so on, so the risk is well worth the payout! In return, mice devour leftovers and help keep the nest a little cleaner and presumably parasite-free than it would be otherwise. As with greenery and hawks, sexual selection might drive a nest-building behavior that also repels undesired guests! Remember 2013? The birds we watch produced young in the teeth of the worst winter since the 1970s. Our eagles were successful in part because the design of their nest influences the microclimate in which eggs and young are incubated. Dad's attention to the nest bowl - rolling, scraping, nest digging, and the careful arrangement of soft materials to form a cup once the substrate is suitable - may both excite Mom and result in a structure that can weather rain, snow, and serious sub-zero temperatures. Of course, if you watch the eagles, you have probably already realized that the types and placement of materials aren't accidental. We've seen the nest bowl and cup carefully prepared ahead of time, and we've seen Dad bring grasses and husks to tuck around Mom while she incubates eggs. So the next time you watch a bird build a nest, either online or off, remember that much more is going on than meets the eye. Sexual attraction, courtship and flirtation, proof of fitness, and protection of young from parasites and weather all appear to play important roles in the design of finished nests. There is a bird that nests inside a wasp's nest! Follow this link to read more about the Violaceous Trogon and its extreme housing practices!